Since ancient times, the winged form of a butterfly was a symbol for the human soul. Egyptian - "the butterflies were presumably one of the pleasures that awaited the deceased in the afterlife, reflecting the Egyptian belief in the immortality of the human soul" [Manos-Jones]. Aristotle gave the butterfly the name psyche , the Greek word for soul. Many cultures relate butterflies to the human soul. 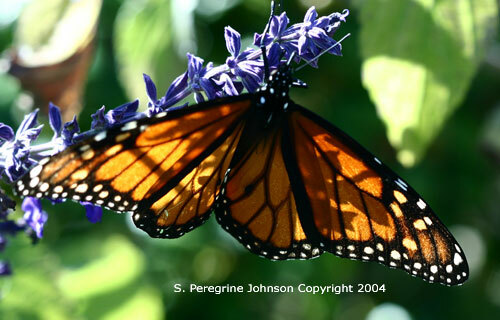 In ancient Greek the word for butterfly is "psyche" which means "soul", and was also the name of Eros' human lover. Coins - butterfly as the symbol of the soul. Aztec - associate the morning star with the butterfly, which represents the soul of the dead” [Manos-Jones]. The Aztecs also believed that the happy dead in the form of beautiful butterflies would visit their relatives to assure them that all was well. These butterflies flew around the house and around bouquets of flowers which were carried by Aztec men of social rank. It was considered ill-mannered to smell a bouquet of flowers from the top. It should always be sniffed from the side, for the top was left for the souls to visit, where they could enjoy the fragrance thus reserved especially for them [Native-Cherry]. Native South Americans also integrated various Lepidoptera into their mythologies. To the Goajiro of Columbia, if a particular large, white moth is found in a bedroom it must not be mistreated for it is the spirit of an ancestor come to visit. If the moth becomes troublesome, it can be removed only with the greatest care or the spirit may take vengeance. Among the Aymara of Bolivia, a certain rare nocturnal moth was thought to be an omen of death [Native-Cherry]. Mexico - A small town in Mexico also sees butterflies as souls, and it is to that town that the monarch butterflies migrate every year on and around the holiday known as the Day of the Dead. They are seen as the returned souls of the deceased. [Coconut Creek]. Russia - A form of the Russian language refers to butterflies as "dushichka" which is derived from "dusha", which means "soul". Andalusian Spain - "An heir must throw unmixed wine over the ashes of the deceased as a toast to the butterfly that will escape with the soul" [Manos-Jones]. Germany - Butterflies are thought to be souls of children [Manos-Jones]. "For Christians, the butterfly's three steps of metamorphosis -- as caterpillar, pupa and then winged insect -- are reminiscent of spiritual transformation"[khandro]. The lowly caterpillar represents our earthly selves, our preoccupation with the physical plane of existence. The chrysalis represents the tomb, the place where the miraculous resurrection takes place, from which the sour rises. The beautiful, free-flying butterfly symbolizes Christ's spirit reborn. The butterfly exists in four distinct forms. Khandro explaines these four distinct forms. The fertilized egg is planted in our mother's womb. From our day of birth, we are like the caterpillar which can only eat and creep along. At death, we are like the dormant pupa in its chrysalis. After that, our consciousness emerges from the cast off body, and some see in this the emergence of the butterfly. Therefore, the butterfly is symbolic of rebirth after death. In images of the Garden of Eden, Adam's soul is symbolized by a butterfly, or drawn with butterfly wings. In paintings of Mary and her Child, the presence of butterflies stands for their care for human souls. The Gnostics depicted the Angel of Death by showing a winged foot stepping on a butterfly [khandro]. To bring you luck, happiness and riches today, tomorrow and beyond [khandro]. In the 1600s, in Ireland , killing a white butterfly was prohibited since it was believed to be the soul of a dead child [khandro]. The dealan-dhe' is an Irish term which is used to refer to a butterfly, but also takes several other meanings. It is also the brightness or lightning of the Gods, or it may be used to refer to a burning stick that is shaken back and forth to create the need-fire [Bronach]. The need-fire is often central to Irish thought. When a fire is created and burned for three nights upon a piece of land that land belong to the person who created that fire. This is the fire of the householder, which is also the fire of man. At Beltaine the household fire is rekindled in every hearth in Ireland from a central fire. Another reference between fire and butterflies can be seen within the term tiene-dhe' , with the usage of tiene meaning fire. This term refers both to the butterfly and to the fire of the Gods [Bronach]. The significance of the butterfly in Irish folklore attributes it as the soul and thus it has the ability to cross into the Otherworld. It is also a symbol of transformation and creation [Bronach]. Old Irish saying "Butterflies are s ouls of the dead waiting to pass through Purgatory" [ Coconut Creek]. Bonach, A. (1994). Butterflies in Irish folklore. Temple Terrace , Florida : House Shadow Drake https://www.traditionalwitchcraft.org/celtic/butterfly.html. Cherry, R. (1997). Native American mythology. cedigest , Fourth, https://www.insects.org/ced4/mythology.html. Khandro . (2005). The butterfly. https://www.khandro.net/animal_butterfly.htm. Manos-Jones, M. (2000). The spirit of butterflies: Myth, magic, and art. New York : Henry N. Abrams.